The sleek LG ChromeBase 22CV241-1 is the first ever All-In-One desktop PC based on Chrome OS by Google and a 22 inch superior monitor by itself that can be used by your other devices. It is designed to be family friendly- easy to use by everyone in your family. It is a super fast computer with a Haswell Celeron processor, a flat screen 21.5 inch Full HD screen, many apps and programs from Google, cloud based 100 GB Google Drive for 2 years and more at a great price. LG ChromeBase has a 4th generation dual core Intel Celeron 2955U at 1.4 GHz, 2 GB DDR3L SDRAM at 1600 MHz, 16 GB Solid-State Drive and Chrome operating system.. The Haswell Celeron processor is suitable for simple, safe, fast computing and web browsing. It only has a 16 GB hard drive but it is a solid state drive to help run the system faster overall and you get to save everything in the secure Cloud that you can access from anywhere and whichever device easily. The software and security settings are constantly updated without you being aware. Chrome based computers are free from viruses and malware, unlike Windows systems. Another reason they run faster than Windos computers is less programs share the computer's storage. The more files and software saved on your hard drive, like is often the case with most PCs, the slower your computer gets. Whereas with the LG Chromebase the system always boots up very fast. 21.5 inch LED backlit Full HD screen with 1920x1080 pixel maximum screen resolution and IPS technology for super wide 178 degree viewing angles, offers amazing picture quality (better than regular HDTV), better color reproductions, great contrast, dimming concept for zero flicker, 5 ms response time, reduced blue light to reduce eye fatigue, reader mode for ideal reading and the integrated 2 x 5-watt speakers for immersive sound for when you're watching videos, editing photos or playing games. White LG ChromeBase is simple and efficient, also not creating any clutter on your desk. It weighs 9.5 pounds with dimensions of 20.80 x 7.40 x 15.60 inches. 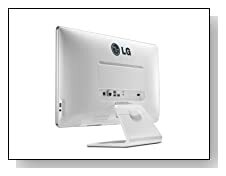 Connectivity options include 3 x USB 2.0 ports, 1 x USB 3.0 port, 802.11 abg wireless, Gigabit Ethernet, an HDMI input and an HDMI output, a headphone/microphone combo jack, a keyboard, a mouse, a cable organizer and an integrated 1.3 MP HD camera with microphone to chat comfortably on Google Hangouts, allowing you to see 10 users at once. 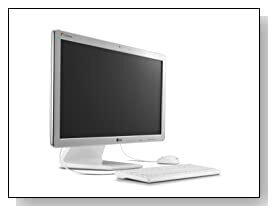 Conclusion: LG Chromebase 22CV241 is a versatile and functional machine both as an all-in-one system and a monitor by itself that you can connect other devices to. You can open and edit Word and Excel documents on the Chrome editor, have thousands of apps to work with and the standard Google stuff like Gmail, Google+, Maps, Search etc. It comes with a 4th generation Celeron processor that is both energy efficient and powerful for what this computer is created to do, 16 GB SSD, 100 GB Google Drive free for 24 months, superb image quality, clear sound through built-in speakers, virus free computing.. Chromebase was given a CES Innovations Award in Jan 2014 as well. Great system unless you need or want a Windows based computer, and at a very affordable price on Amazon.com.